If this is the case, which it certainly must be if Krishn says it is, then who are we behind all of that? If we are not the actual doer then who are we? What is our individual identity once we break free from maya? Do we even have an individual identity? Does each jiva have individual characteristics in the spiritual world that define us the way that we do here in the material world? I know that in essence we are all jivas (souls) but we also have individuality in this world as defined by our personalities and other characteristics that define us materially. I also understand that those characteristics are worldly and temporary. Are we, then, as individual souls, any different from each other once we reach the point of shedding the body or in reality are we all the same/equal in the spiritual sense? Answer: Our true identity is the Divine soul. The soul, being infinitesimal, has no form (is nirakar), so it is impersonal. Along with the soul, we eternally have a material mind and senses which are part of our personality. The same mind and senses have been with us since eternity and go with the soul when we change bodies (die). The soul has a personal identity when it has a mind. When the soul gets liberation, the material mind and senses are dissolved back into the mayic energy and only the pure soul merges into formless God. In this state, the soul still exists. The soul can never cease to exist. However, the soul no longer has a personal identity, because it has no mind or body or senses. But soul retains its impersonal identity as an individual soul merged within God. This is the situation when a soul receives mokch or mukti and merges into impersonal God (nirakar brahm). When a soul attains the personal form of God (sakar brahm), then that soul receives a Divine mind, senses and body, and thus retains his personal identity. He enters into the abode of the form of God which he attained. The individual traits of that soul's (Divine) personality are unique to him because they are determined by how he loved Krishn during his devotional period, what his relationship is with Krishn, what kind of desires he had from Krishn while doing devotion, how he likes to interact with Krishn, etc. 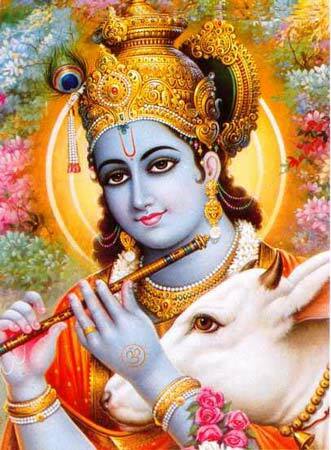 So the Saints in Krishn's Divine abode are all very individual in their behavior, personality, love for Krishn, etc. In the Divine world, there are tall Saints, short Saints, young Saints, old Saints, skinny Saints, hefty Saints, quiet Saints, loud Saints, playful Saints, serious Saints, bashful Saints, bold Saints, etc. In other words, you are still you, even after God realization. Your personality remains, but you have become Divine. Regarding the soul being the doer (karta) of actions, or being a non-doer (akarta), we find both kinds of references in our scriptures. Soul on its own cannot think or know or experience or do anything. Soul with a mind can think, know, experience and act. Technically, it is the mind that thinks, knows, experiences and performs actions, but it only does so because the soul is giving life to it. Since the mind cannot do anything unless the Divine soul is giving life to it, so from that point of view, the soul could be said to be the doer. But since it is actually the mind with which we think, and soul cannot think without a mind, so the mind is said to be the doer. The mind is made of maya, and the soul is Divine. Since the mind is made of maya (as are the senses and body), so it means the mind is made of sattva, raj and tam (the 3 qualities of maya). Each person thinks and performs actions according to the quality which predominates in his mind at that time. When sattva predominates, then a person's thoughts and actions will be good. When tam predominates, then a person's thoughts and actions will be bad. When raj predominates, then a person's actions will be selfish, but neither good nor bad. According to a person's quality of mind, so will be the quality of his thoughts and actions, thus the mind is said to be the doer. The soul is beyond sattva, raj and tam because the soul is not mayic. Thus, the soul cannot be sattvic or rajas or tamas, but our mind is. So, the soul cannot be said to be the doer of any sattvic or rajas or tamas action. It is the mind which is the doer. For all of these reasons, our scriptures say that mind is karta and soul is akarta. However, if we understand the situation more deeply, we see that the mind is not our true self and cannot do anything without the energy it receives from the soul. It is a very subtle matter, and the analogies I am about to give you do not exactly capture the truth of the matter, but they point us in the right direction. First of all, understand that the soul and mind are completely together, like if you pour water (the mind) into milk (the soul), then you cannot visually see any separation between the two. They apparently are one. Like this, the mind is adhyasth (established) in the soul. Secondly, understand that the potential for all thought and action resides only in the soul. The mind is a lifeless energy since it is part of maya. So mind has no life, and it cannot think or do anything on its own. The potential for thought and action lies within the soul, just like the potential to see lies within the mind and the subtle sense of sight (with which you see the dreams). However, just as you cannot see unless your physical eyeball is in place, you cannot think unless you have a mind. The eye is just a physical thing and the real sense of sight is subtle and lies within the mind, yet without the lens of the eye in place, the potential to see cannot be realized. Similarly, the mind is just a lifeless mayic energy, yet without the mind in place, the potential to think which lies within the soul cannot be realized. Another analogy is that of the engine of a car, which produces potential kinetic energy. The firing of the pistons turns the drive shaft which has the potential to move the car forward. However, unless the drive shaft is connected to the axle of the car, the wheels will not move forward. Similarly, the soul provides the energy for all of our activities, but without the mind, that potential energy cannot be put into action. Thus, from this point of view, soul is said to be karta (the doer). Now that I have laid out these basic points, let me address the specific verses which you mentioned. The meaning of these verses is very abstract is a part of the Sankhya philosophy. It is a very dry and intellectual philosophy which in gist tells us that we are not the mind, we are the soul. If you know that much, it is enough. Nonetheless, I will elaborate a little on these verses to clarify things and eliminate any confusion. When Shree Krishn says that you are not the doer - the 3 gunas of maya (sattva, raj, tam) are the doers - it doesn't mean that you are not responsible for your actions. You are. It means that your mind, which is made of sattva, raj and tam, is the doer. But you are not the mind. You are not a mayic being. You are the Divine soul. Depending on the quality of your mind, you will perform actions accordingly, but the soul is beyond sattva, raj, tam. So the soul cannot be said to be the doer of any sattvic or rajas or tamas action. But the person who is deluded by the effect of maya, who is not beyond ego, believes that he is his mind and he is his body. So he performs all of his actions with attachment in the world. The main point is that you are not mayic, so don't be attached to the mayic world. You are Divine and you belong to God, so love Him. The one who believes himself to be the mind and body believes that he is enjoying the pleasures of the world and suffering the pains of the world. In fact, it is just the interplay of the mayic gunas. Your mayic mind and senses indulge in the mayic objects and then experience pleasure or pain. But none of this has anything to do with the soul. The soul is Divine and desires only God. Therefore, live in the world without attachment, moving through your life and fulfilling your duties with your attachment in God. Then you will not perform any binding actions, because the binding quality of an action is due to the worldly attachment. That means that while performing all of the actions, you will not be performing any actions, because you are doing them without any attachment. This is the "non-action action" of the Gita, which is also called karm yog. In this sequence of verses from the 18th chapter, Shree Krishn elaborates on what factors are involved in performing an action. As I explained above, soul alone cannot perform any action. Here Shree Krishn mentions five factors: body, senses, mind, cheshta (effort) and daiv, which means destiny (in this case, the destiny being referred to is our sanskars, which affect the state of our mind and influence our moods and desires). All are involved in carrying out any action. Krishn also mentions that not only what we do physically counts as karm, but also what we say and what we think. Then He says that if someone believes that the soul alone can perform actions, then they are mistaken. The soul plus the mind, senses, body, etc. performs the actions. In the 17th verse He tells Arjun again that if he performs his actions without attachment, then those actions are non-actions (they will not bind him). I will conclude by mentioning that to correctly understand any spiritual philosophy, it is imperative to learn it from a God realized Saint. This is why I strongly recommend all people to read the books and listen to the speeches of Jagadguru Shree Kripaluji Maharaj in order to understand the teachings of any scripture, including the Gita. By reading these scriptures directly, we multiply our confusion, not our understanding. Only a true Saint can distill the knowledge of the Gita and other scriptures into a form which is understandable to ordinary souls like us. His book "Prem Ras Siddhant - The Philosophy of Divine Love" and his speeches "Brahm Jeev Maya Tattva Gyan" and "Main Kaun Mera Kaun" are treasures of knowledge which clear all a devotee's confusions and give him correct spiritual knowledge. These are available (or will be available soon) from the JKP bookstore. The soul is ansh of God, part of jeev shakti, anu chit, ansh of sat chit anand, thus desires sat chit and anand. What is the value of mantra dikcha?